Yossi Milo Gallery is pleased to announce an exhibition of large scale, color photographs by Pieter Hugo from the series The Hyena Men and Wild Honey Collectors. The exhibition will open on Thursday, November 29 and close on Saturday, January 12, with a book signing and reception for the artist on Thursday, November 29 from 6:00 to 8:00 pm. This will be Mr. Hugo’s first solo show in New York. 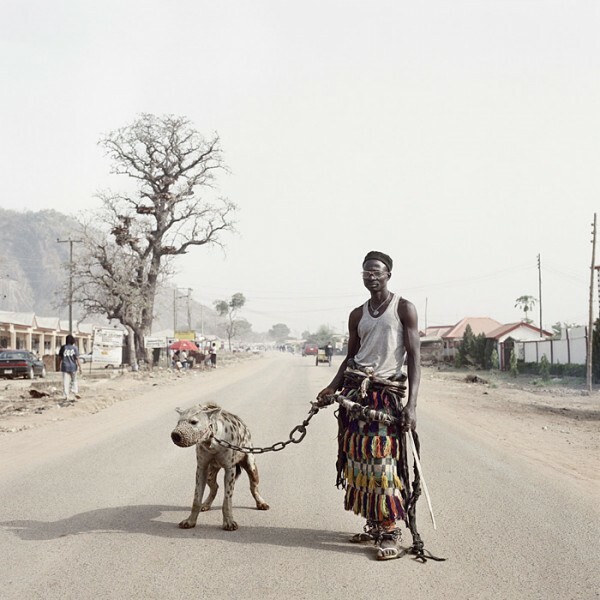 Pieter Hugo created the series The Hyena Men while traveling in Nigeria with a troupe of animal charmers and their collection of tenuously domesticated hyenas, monkeys and snakes. The portraits feature groupings of men and animals surrounded by the barren urban centers of northern Nigeria. Taken during quiet moments between the spectacles of street performances, the photographs depict a stillness that subverts the tense physicality of the animals and their trainers. The Honey Collectors series emerged from a period Mr. Hugo spent with a collective of workers in the forests of Ghana. Enshrined in cassava branches and plastic to protect themselves from stings, the men go about the process of smoking out the bees in order to gather the unattended honey. Mr. Hugo catches the costumed foragers during breaks from the frenzy of their pursuit, frozen against a background of impossibly lush greenery. Mr. Hugo is a Standard Bank Young Artist for 2007 and won first place in the 2006 World Press Photo Awards for portraiture. His book The Hyena and Other Men, which includes his own writing as well as an essay by journalist Adetokunbo Abiola, will be released by Prestel this month. Pieter Hugo was born in South Africa in 1976 and currently lives near Cape Town.